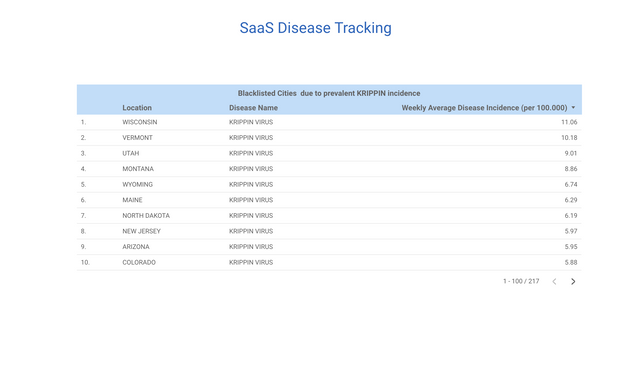 SaaS BigData Disease Tracking Dashboard is released! SaaS can now avoid applicants from locations with high amount of Krippin Virus Incidents, and seek applicants from location with low amounts of the virus. BigQuery is used to quickly query this data, and the result is displayed in Data Studio in Google Cloud. We use a public dataset of disease outbreaks from “From Health and Human Services” in the US. The dataset consists of 759467 rows of data with diseases, locations and incidences per 100000 inhabitants. By using big data to provide insightfull reports for SaaS we think we deserve the [The analyst] badge.